There’s been talk in the popular media that somehow fish is the best choice for health. Well, I wouldn’t take the bait on that one. Hmm… that doesn’t sound like a miracle food to me. But what about the Eskimos? Weren’t they supposed to be nearly immune from heart attacks because of all the fish they eat? Well in fact doctors have determined that, despite very large intakes of fish oils and their omega 3s, their heart disease and stroke levels were as high as any others. Many commercials tout the benefits of omega-3 fatty acids found in fish. Even if there were some benefit to fish oils in our diets, the vegetarian advantage would still prevail. For instance salmon indeed has 20% of its fat as omega-3s. However, flax seed has 57% of its fat as omega-3. But this only tells part of the story. A serving of salmon has 52mg of cholesterol while flax has zero. To make matters worse, salmon contains 25% of its fat as saturated fat, while for flax it’s only 9%. All that cholesterol and saturated fat means that the omega-3s in salmon carry quite a price tag. Dietary saturated fat and cholesterol have been shown to often lead to clogged coronary arteries causing a heart attack, the number one cause of death in America for both men and women. In addition to artery clogging saturated fat and cholesterol, fish also carries significant levels of toxic chemicals. Let’s take a look at the mercury levels first. Canned tuna typically contains about 360 ppt mercury. Just two ounces of tuna would supply 20 micrograms of mercury – three times the safe daily exposure set by the National Research Council for toddlers. The amount of tuna typically contained in just two sandwiches would supply more than four times the safe weekly exposure for a five-year-old. Mercury is especially dangerous for women of childbearing age. One study found that about 8% of women have blood levels of mercury above the EPA safe limit, and 16% of women were found to have levels that exceed the safe limit for carrying fetuses and breast feeding. Chronic exposure to mercury has a very serious effect both on the developing central nervous system in fetuses and children, and on the adult central nervous system. Mercury exposure in adults has also been linked to increased risk of heart disease. Dioxin levels in fish are also a concern especially for pregnant and breastfeeding women. 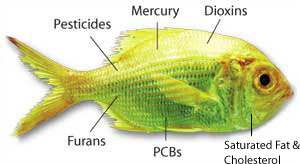 Freshwater fish have dioxin levels of almost 20 times, and ocean fish have four times the level of dioxin found in plant foods. The situation is much the same for PCBs and several other toxic chemicals. Dioxin exposure is associated with an increased risk of cancer including breast cancer. Dioxin can also cause severe reproductive and developmental problems. Fish have an even higher carcinogenic potential once cooked. Cancer-causing substances called heterocyclic amines (HCA’s for short) are formed whenever animal flesh, including fish, is cooked. More HCAs are formed, the higher the cooking temperature, making grilled fish and other grilled meats particularly damaging. There’s a pattern to many nutritional crazes. At first there’s little talk about the nutrient in question, then it’s a total miracle and a spate of books come out telling us all to go swimming in the stuff, and then some time later research tempers the enthusiasm in varying degrees. Fish seems to be following the same pattern. Some recent medical studies have failed to confirm the role of fish in preventing both heart disease and dementia. Another found that those who had no fish in their diet actually had lower rates of depressed mood than others. In fact, one British study found that those with lower levels of omega-3s were, nevertheless, in excellent health all around. While some omega-3 oil in the diet is undoubtedly important, especially for pregnant women and children, and the final word has yet to be written on the subject, vegetarians need not worry about getting plenty in their diet. Whole flax seeds and unfiltered flax seed oil contains lignins have been shown to have extra health benefits, reducing cholesterol and the symptoms from enlarged prostate among other things. Other good sources of omega-3s include walnuts, hemp, soy and canola. So why would anyone choose to get their omega-3s from fish when the price tag includes saturated fat, cholesterol, mercury, dioxins, PCBs and HCAs? Some over-enthusiastic proponents make it sound like eating fish is vital to life and health, and we’d all die without it. We saw the same tactics when it came to beef. Of course, if we’re all supposed to get sick and die without fish (or beef) then how come vegetarians are generally healthier and live longer than others, including the fish eaters?